From the beginning of the contest we had an average of 200 uploaded pictures per day, with a variety of constructions, most of them religious, civil and military, but also archeological zones. As part of the contest activities we organized last Saturday a Photo Tour to the historical center of Mexico City (Centro Histórico de la Ciudad de México). 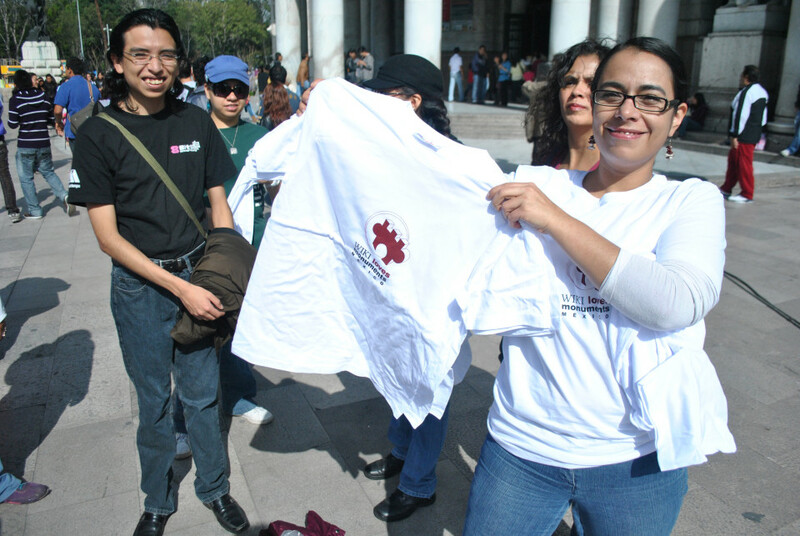 The gathering took place in the esplanade of Palacio de Bellas Artes, in which we had 21 attendees from all ages equipped with all types of cameras ready to take a shot. Along the tour I made a brief historical exposition related with the buildings and some anecdotes about them. We started the tour by Tacuba street, we admired the Plaza Manuel Tolsá and we took pictures to the Palacio de Minería, neoclassical work finished by the end of XVIII century. The walk follow by Donceles street, one of the oldest streets in town. In which the spanish conquerors settled down in Mexico, in the street it is possible to admire several architectural styles and how the Mexico city was built in different times throughout her history: Baroque in several modes, Neoclassical, art-nouveau and contemporary architecture. The Donceles street has been a protagonist of city life on many occasions like the Allende Theatre turned into Chamber of Deputies of Mexico, today the Legislative Assembly of Mexico City, or the Esperanza Iris theater, where there were legendary artists as Enrico Caruso and Anna Pavlova. Magnificent examples of baroque architecture were registered in the attendees cameras such as the House of Condes de Heras y Soto, an architectural piece from XVII and their relief central – a child with baskets full of fruits on the top of a lion head – called the attention of our photographers. Our journey continued by Donceles street, through memorable buildings like the Old College of San Ildefonso, the archaeological site of the Major Temple of Mexico-Tenochtitlan until Calle de la Moneda, where we saw many legendary monuments such as the Casa de las Campanas or the first Print of America, the former convent of Santa Teresa La Antigua and the Palace of Autonomy of UNAM. The tour finished in the bustle of a packed Constitution Square, best known as El Zócalo, filled with pedestrians, street vendors and tourists. We walked to the atrium of the Cathedral, where we end our tour with a final talk about the main square of Mexico City throughout the centuries. Some attendees ended the meeting with a drink at Cafe El Popular. For Wikimedia Mexico it was very enriching experience, because the balance between amateur photographers and experts attending allowed photographic knowledge sharing. Some attendees said they often walk by the buildings and do not stop to contemplate the magnificence of the buildings, which remain as a monumental step footprint of several generations by the current Mexican capital. Find more information about Wiki Loves Monuments in Mexico on www.wikilovesmonuments.mx . I wish you 100k photos next time. Not only from Yucatán.